Attention High School Seniors! Are you planning to further your music education? Do you sing or play an instrument? If you answered yes to these questions, then we have scholarship money for you! The Fort Walton Beach Community Chorus will award two (2) scholarships, each in the amount of $1,000.00, to two (2) graduating high school seniors from Okaloosa or Santa Rosa County who plan to continue with his/her music studies at the college level. Each scholarship will be given to assist the student’s music study during a single college year. 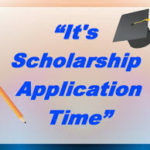 An application form and more information can be found on the “Scholarship” page of this site. Applications are due March 16, 2018 and auditions will be held on April 8, 2018.